For you scientists out there, I have a question. When you’re contemplating an Erlenmeyer flask or beaker filled with colored water (as you scientist types so often do), what color do you prefer? Today we’ll concentrate on orange. Here’s a picture that makes me happy for several reasons. First of all, it’s picture of a thoughtful scientist holding insight-bestowing colored water in laboratory glassware. These always amuse me, even when they’re absurd stock photo fictions. But this one is real. 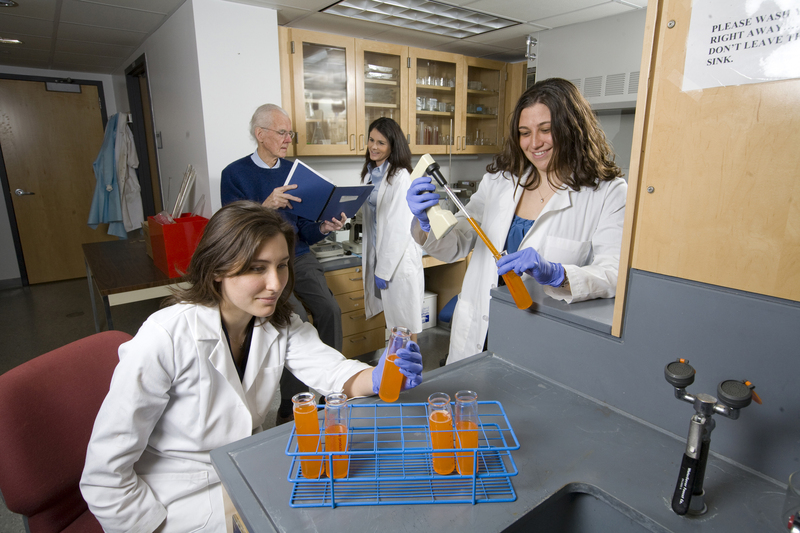 This is a real scientist who is actually studying orange-colored water (a sugary orange soft drink). And it’s interesting research (high-fructose corn syrup prompts considerably more weight gain than an equivalent caloric load of sucrose). And it’s at my alma mater. And as it happens orange is one of the school colors. Man, what a great shot! Look at the whole picture and you’ll see they’re clearly having a good time posing for the picture. You can almost hear them planning the shot: “Let’s do one of those colored-water-in-beakers photos!” I don’t know if those purple gloves were necessary for the lab work, but my, they look dandy next to the orange water. It doesn’t make for much of a cover shot, but if one of us ever does manage to change the world, it’ll start with a puzzled glance at a computer screen, or a raised eyebrow while looking at a piece of paper. Instead of getting noisier, everything will get a lot quieter. And if there are any purple spotlights to be seen, we won’t even notice them. . .
See this fish? He’s bad news. This is not just any fish. This fish nearly punched the lights out of the Enlightenment. Oh, he seems likable enough for a red gurnard. But at parties, after he gets into the brandy, he parades around and insists on being called Aspitrigla cuculus of the Scorpaeniformes (I understand they have a lovely place by the sea). And in his day he was capable of some violence: this cuculus nearly killed calculus. The picture is from Francis Willughby’s De Historia Piscium, also known as the History of Fishes. It is a lovely piece of work filled with detailed illustrations, but it is especially distinguished by a curious footnote. Published at great expense in 1686 by the Royal Society, it was a commercial flop. So much so that they Royal Society lacked the funds to proceed with its next offering: Isaac Newton’s Principia Mathematica. It is only because Edmund Halley “saw something in this Newton kid” and underwrote the first edition Newton’s magnum opus that any of us exist, since as you know, if the Principia had not been published, none of us would be here today. The Historia Piscium was a work begun by Francis Willughby (1635-1672, F.R.S. 1663), completed by John Ray (1627-1705, F.R.S. 1667) and brought into print with the financial support of The Royal Society. The text and illustrations of the Historia Piscium reflect the 17th-century origins of the enterprise: Ray’s quest to recover the knowledge and language lost in the Fall, and The Royal Society’s support for establishing a reformed natural history of fish through publication. Ray’s biblical belief in the corruption of human language and knowledge led him to reform natural history through ‘characteristic marks’. He sought to define, classify and depict fishes through their external features, which when matched up, would yield the same nature, and thus allow humans to identify and give a name to a fish. This leads to a pet topic of mine. Christianity figures prominently in many scientific histories. Often enough, misplaced theology led to good science, and in aggregate this science ultimately led to the modern Western scientific mindset (which in turn put pressure on Christianity, but that’s another story). In the same way that magical alchemical reasoning prepared the way for modern chemistry, was there something special about the Christian mindset in the High Middle Ages that put European science on its spectacular ascent? Salem, Massachusetts is in love with witches. It took three hundred years or so for them to come around, but they’ve fallen in a big way. I spent some time in Salem this weekend, and I can attest that, in addition to the various museums and tours, the “witch on a broom” motif is everywhere, including the local newspaper. While it’s no big surprise for a town to embrace whatever helps its tourism receipts, two things do jump out at me. One is that I grew up in the Bible Belt (North Carolina), so the whole idea of a town embracing witchcraft is amusing and encouraging. It’s hard to imagine a witch museum in Branson or Pigeon Forge. The other surprise in Salem is that there seems to be so much in the way of “serious magic”. I apply this term very loosely to a New Age-y collection of people who call themselves witches or wiccans or pagans or simply working-stiff astrologers and chiromancers. The point is that the witch is not the Other to be mocked, even in a light-hearted way, but rather a pillar of civic life. Breadwinner and boon bestower, she is celebrated. Which is all rather odd when you consider that this is so only because a handful of people wrongly labeled as witches were tortured and murdered here three hundred years ago. This brings me to the magic stores. I’m fascinated by these stores. Some of them are cynical and tacky, but others are quite serious. They are packed not with hocus-pocus tricks, but with books of spells and crystal balls and scrying glasses. The magic spells in these books offer what you might expect: money, power, true love. But do they work? I didn’t try any, but consider this. If they did work, if they were potent, demonstrable, and consistent, then they wouldn’t belong in a spell book. Because they wouldn’t be magic anymore. Lightning, eclipses, magnetism, these things once belonged to the magicians, but scientists took them away. This is one of the essential characteristics of magic. It is not simply unreliable; it is by definition unreliable. The whole experience of visiting the magic shop thus reduces to a problem in aesthetics. I find this very liberating. If you like it, you like it, full stop. If you think the crystal ball looks cool, you should buy it. It’s not a vacuum cleaner. There’s nothing to test, nothing to verify. Does it work? Of course it doesn’t work. Or rather, its charms work inasmuch as it charms you. De gustibus non est disputandum. That’s the real trick. Quick: which is more important? Reason or wonder? I just finished reading a gift from my sister-in-law, an odd little book called Mr. Wilson’s Cabinet Of Wonder by Lawrence Weschler. Actually, the book isn’t so odd… it’s the book’s topic that is odd: The Museum of Jurassic Technology. The cabinet of wonder is the museum, a bizarre and disordered little museum on a nondescript street in Los Angeles. But the more nonsense you read about it, the more sense it all makes. Wonder is the fountainhead of reason. Wunderkammern, or rooms of wonder, were the sixteenth century predecessors of museums. In modern terms, they were eccentric collections of tchotchkes and oddities from the natural world thrown together with, ideally, a sense of style. Like this: Athanasius Kircher takes us from here to here, where we learn about these and this which eventually takes us to Arthur Ganson’s Machines (make sure you watch Wishbone Man walking, that tiny tireless Sisyphus). And from Wishbone Man it is a short stroll to here.